CLEMENTS, George Henry (1854-1935), artist and watercolorist who specialized in coastal scenes. He worked as a clerk for the New Orleans Cotton Exchange before turning to painting in 1880. 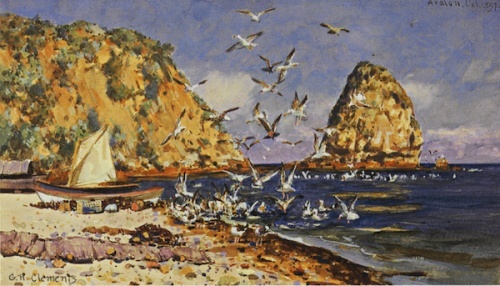 Clemente was one of the earliest artists to visit and paint on Santa Catalina Island (1897). After the turn of the century he settled in New York. This page was last edited on 13 October 2018, at 15:33.